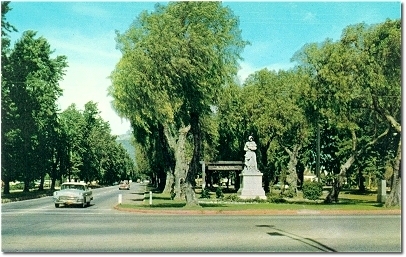 How many times over the years have you stopped at the intersection of Foothill and Euclid in Upland and noticed a Monument in the center divider on the north side of the intersection....I'm sure most of you have never given a thought as to what or whom this monuments is about or decade to. The monument is called, the Madonna of the Trail Monument....The monument was dedicated on February 1, 1929 and is one of twelve monuments commissioned in twelve different states where the old Santa Fe trail ran.....The monument was rededicated February 9-11, 1979 when it was decided to put in new grass, plants, curbing and Foothill and Euclid were widened and improved. 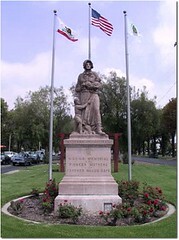 In the late 1920's, the National Society of the Daughters of the American Revolution commissioned the design, casting and placement of twelve memorials commemorating the spirit of the woman pioneer......These memorials were placed along the route of the National Old Trails highway and extended from Washington, D.C. to Los Angeles, California. The idea for the Madonna of the Trail Monuments began in 1909 when several Missouri women wanted to mark the Santa Fe Trail and the part that American Women played in moving their families and the country west.....Later, the National Society of the Daughters of the American Revolution joined their effort.....The groups began working side by side with the National Old Trails Road Association which was headed by then Judge Harry S Truman, of Independence, Missouri....That highway closely approximated the paths of Braddock's and Washington's Road, the National Road, Boone's Lick Road, the Santa Fe Trail, and the Old Trail.....The road ran from Washington, D.C. to Los Angeles.....The original plan called for the placement of over 3,095 highway markers along the entire route....This idea failed, as it was realized it would cost to much to go out to all of these markers and take care of them, not to mention several hundred people that would be required year end and year out to maintain them....The groups elected instead, to place monuments in each of the state through which the highway ran. 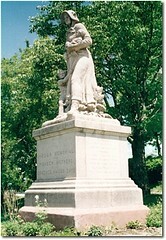 The monument itself was conceived by Arlene B. Nichols Moss, of St. Louis, Missouri.....Moss was inspired by a statue of Sacajawea that stood in Portland, Oregon. On September 7, 1927, the group selected a statue of a pioneer woman clutching two small children and a rifle. The statue was sculpted by August Leimbach and cast in an amalgam of crushed granite, stone, marble, cement and lead ore.......The statue stands ten foot tall and weighs over five tons......The statue sits on pedestal that measures five foot by five foot by six foot high and weighs twelve tons and sits three feet underground and two feet above....It has survived Earthquakes, floods, snow, blazing heat and even a drunk driver that crashed into the base of the monument about 20 years ago. Madonna Statues are located in the following states; Bethesda, MD, Beallsville, PA, Wheeling, WV, Springfield, OH, Richmond, IN, Vandalia, IL, Lexington, MO, Council Grove, KS, Lamar, CO, Albuquerque, NM, Springerville, AZ, and of course, Upland. I was in fifth grade in 1979 when they did the rededication. I went to Sierra Vista elementary school. All our names were entered into that time capsule. I wonder if Anybody viewing this site was around and got their name in there as well. Hope to be there when they open it. I was there... I was in the parade... I went to Sierra Vista until I moved to Washington in 1980. Walking up this trail inspires me to not stop keep strong in Life for my family. I was a student at Valencia Elementary in 1979 and I remember when this was opened. I remember either my name or something i made went in again. I was maybe third or fourth grade? I have muddled memories of learning about the Donner Party and thinking the descendants went through Upland, but that could be the confused memories of childhood. I’ve always liked that statue and what it represents.